While in high school I discovered several short stories written by Saki. They always had elements of surprise and humor. Saki is the pen name for a British writer, Hector Hugh Munro (1870-1916) whose short stories present a satirical view of Edwardian society. His stories are sometimes macabre, and sometimes mischievous but always very entertaining. Saki wrote several ghost stories, one of his most famous is The Open Window, which he wrote in 1914. The Open Window is a brief story, only two pages in length, which is set in a small village in the sitting room of a an upper-class family. The story finds the main character a young man who has been sent to the country to calm his nerves being entertained by the families’ fifteen-year old niece while he waits for the appearance of the mistress of the house. This very self-possessed fifteen year-old proceeds to tell the high-strung guest an eerie family tale of tragedy, which results in a very nasty shock. Saki tells this story in a fast paced, smooth deadpan manner. His story ends with a very humorous twist. 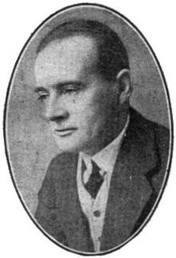 Munro (Saki) is considered a master of the short story and The Open Window is a good example of his writing style. The following link has a written version as well as an audio recording of The Open Window. Enjoy. Here is an 11 minute video of this story--re-titled, The Open Doors. 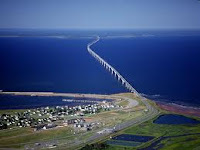 For two hundred years countless people who have lived near the Northumberland Strait that runs between Nova Scotia and Prince Edward Island have witnessed a very unique phenomenon. All these witnesses, whether they were on the water or on land, have reported seeing a three-masted brigandine moving fast through the Strait. As they watch this ship it catches fire and then just disappears. The ship has been seen year-round but it is most often spotted in the fall months just before a northeaster blows in. Because of this many feel this fiery ship is a harbinger, which foretells a storm’s arrival. One witness who lived near Murray Harbour on Prince Edward Island in 1912 reported that she and her eight-year old son watched the ship for thirty minutes as it approached where they stood on shore on a clear bright day, she stated that it was a three-masted schooner. She recounted that it stopped when it reached where they stood. She described its crisp pure white sails and black shiny hull, she saw the ship catch fire and then numerous crewmembers came up on deck and were engulfed in the flames, to her amazement the ship then just disappeared. Besides individual reports many large groups have witnessed this phenomenon. Ferries that crossed the Strait on a regular basis before the Confederation Bridge was built between Nova Scotia and Prince Edward Island often encountered the phantom ship only to then lose sight of it. Later a thorough search was conducted, including explorations by divers, but it failed to reveal any trace of the mysterious ship. Two nights later another group reported seeing this burning ship again but it was sailing through the strait in the opposite direction quickly. Its fast movement has perplexed more than one witness because it is often spotted when there is no wind stirring the water. Over the years people have attempted to reach the burning ship only to have it disappear at close range into thin air. A ferryboat captain reported sailing straight through the flames finding nothing. A group of rescuers even disappeared themselves during their attempt to help the burning ship. This rescue crew in 1885 was lost and never heard from again. No one knows for sure the identity of this phantom ship or where it came from but there have been many theories put forth over the years. Here are just a few. 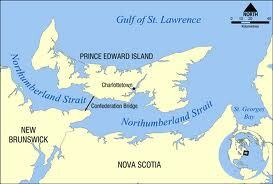 One theory states this ship was lost in a violent storm, in Nova Scotia. Many coastal residents at the time felt that the ship must be the Isabella, which set sail with a cargo of lumber in December of 1868 and was last seen by a light-keeper on Amet Island, thereafter no trace of the ship or crew was ever found. Another theory is this phantom ship must be an old immigrant ship of Highland Scots who were lost at sea while searching for new land. Yet another theory is that she was a pirate ship sunk near Merigomish by a British warship during the Napoleonic War. The most colorful explanation is about a pirate ship that pillaged a vessel from the old country and then got in a drunken brawl with another pirate ship over their ill-gotten booty. It is stated that both ships caught fire and all hands were lost. Even though the origins of this fiery ship are not known-- one thing is for sure-- the overwhelming eyewitness reports of this phantom ship over a large span of time, plus the remarkable consistency of these accounts make it hard to ignore this phenomenon. 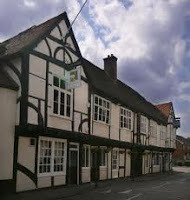 The Ostrich Inn is one of the oldest inns and pubs in the UK. Documents and records date it back to 1165. The Inn that stands today was built in the 1500s. It is located near the ancient village of Colnbrook and was originally a popular coaching inn located on the main stagecoach route from London to Bath. Many ghosts have been seen at the inn. This paranormal activity is attributed to one of its former landlords who was a serial killer. The Ostrich Inn story reminds me of America’s first serial killer H. H. Holmes of Chicago’s Murder Castle with the exception that the Ostrich landlord appears to have been more prolific. A man by the name of Mr. Jarman was the landlord at the Ostrich in the 17th century. Just like Holmes he preyed upon the guests that stayed at the inn he ran. Jarman’s victims were weary travelers who stopped at the inn in order to rest up and change clothes before they made their appearance at Windsor Castle. These travelers carried vast sums of money with them in order to buy the court’s favor. When Jarman discovered the wealth they carried with them it sealed their fates. Over time just like Holmes, Jarman devised a very methodical and diabolical way of killing his unsuspecting victims. He would ply them with strong drink and offer them the ‘best room’ in the inn. Once he was sure his victim was asleep Jarman would remove two bolts from the kitchen ceiling below. This caused the bed where the victim slept to tilt down at a 45-degree angle, which resulted in the inebriated guest sliding out of the bed into a vat of boiling fat that lay below. These poor victims were killed instantly. Jarman would then take their horse and clothes and sell them to close-lipped gypsies. He disposed of what was left of their corpses in a nearby river. Jarman was able to get away with these murders for many years until one traveler that fell asleep in the booby-trapped bed woke up and got out of the bed to use the chamber pot. As he turned he spotted the head of the bed tilting down and saw the boiling vat below. This man’s shouts awoke other guests and Jarman’s murderous activities finally came to an end. Jarman was hanged for his crimes and before he died he boasted he had killed 60 people. A working model of the tilting bed, which was a four-poster, is still on display at the inn today. Moreover that part of the chamber whereupon this bed and bedstead stood, was made in such sort, that by pulling out of two yron pinnes below in the kitchen, it was to be let downe and taken up by a draw bridge, or in manner of a trap doore: moreover in the kitchen, directly under the place where this should fall, was a mighty great caldron, wherin they used to seethe their liquor when they went to brewing. Now, the maen appointed for the slaughter, were laid into this bed, and in the dead time of night, when they were sound a sleepe, by plucking out the foresaid yron pinnes, downe would the man fall out of his bed into the boyling caldron, and all the cloaths that were upon him: where being suddenly scalded and drowned, he was never able to cry or speake one word. Then they had a little ladder ever standing ready in the kitchen, by the which they presently mounted into the sid chamber, and there closely take away the mans apparell, as also his money, in his male or capcase: and then lifting up the said falling floore which hung by hinges, they made it fast as before. The dead body would they take presently out of the caldron and throw it downe the river, which ran neere unto their house, wherby they scaped all danger. Thomas Cole, one victim of Jarmans, is said to be one of the ghosts that haunts the Ostrich Inn. 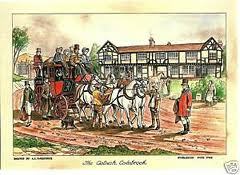 The town of Colnbrook is supposedly named after him. 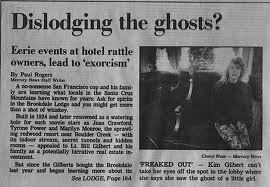 Many ghost hunter groups have investigated the inn over the years. They state that the room where the tilting bed was located and the dinning room next to it both have a strange oppressive atmosphere. These groups have recorded unexplained sounds and have captured some strange anomalies on film. Two of the other ghosts at the inn are a Victorian lady and a shadowy figure that have been seen wandering the upstairs corridor. Many staff members at the Ostrich have entered locked rooms where the lights and electrical equipment are all switched on. Downstairs near the ladies restroom, where Jarman would have stored the bodies of his victims, cold spots have been felt and some are overwhelmed with feelings of despair. In Search of… was an American documentary television show that aired from September of 1976 until March of 1982. This series investigated offbeat and often controversial topics. The show always started with the disclaimer that the information it presented was based upon theory and conjecture. It was stated that the purpose of In Search of… was to “suggest some possible explanations, but not necessarily the only ones, to the mysteries we examine.” I found the series above all else to be very entertaining. The series creator was Alan Landsburg a television writer, producer, and director. Landsburg also produced “Biography” and the “National Geographic Specials” etc. The original shows were based upon a series of paperbacks he wrote about ancient mysteries and their outer space connection. Rod Serling, the creator of the “Twilight Zone” series hosted the original episodes. Leonard Nimoy, famous for his role as “Mr. Spock” in the “Star Trek” series then became the regular host. In Search of… explored and investigated an eclectic mix of subjects. The series explored everything from the death of Marilyn Monroe to the Abominable Snowman. The show posed the question did Sherlock Holmes really exist to a show that focused upon Sun Worshippers and solar energy. Included among the many topics over six seasons were UFO’s, myths and monsters, missing persons, missing cities and missing ships, and of course the paranormal. The show always started with a teaser and a clip introducing that episode’s topic. This was a really good devise to heighten the viewers’ anticipation. The format of the show included interviews, reenactments, and scene footage with voice-overs from Nimoy. The series aired on the A&E Network and then on The History Channel. Re-runs are no longer shown because of a licensing agreement that ended in early 2000. Most of the episodes although can be seen on YouTube. The series also had several really good episodes about ghosts. 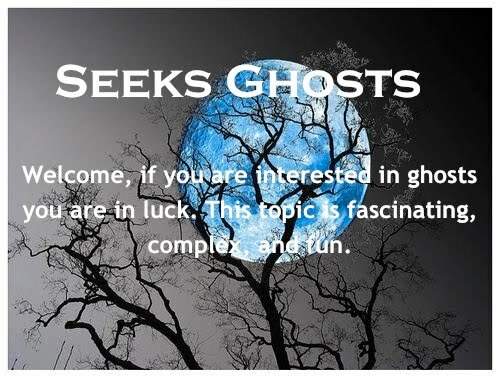 The first was entitled “Ghosts.” It focused upon an investigation Dr. Hans Holzer conducted. Holzer was a parapsychologist, ghost hunter, and a pioneer within the paranormal community, he passed away in 2009. Other episodes included topics about spirit voices, haunted castles, and a ghostly stakeout, which was a forerunner to all the ghost hunter shows on television today. In fact, In Search of… a show about such unusual topics was the ground breaker for many television shows today. Following is the link to the first of three parts of the In Search of… 30-minute episode entitled “Ghosts.” Enjoy. Colorado has many tales of ghosts that appear in, around, and on trains. Many engineers and conductors tell stories of passengers that appear and then quickly disappear. One such tale that I have heard first hand is about a female ghost, Essie Monroe Mentzer, who died in October of 1898. Essie’s family was pleased when she married a “gentleman” doctor by the name of O. F. Mentzer. Unfortunately for Essie this marriage turned out to be an unwise choice, for Mentzer abused prescription drugs, alcohol and his wife. Divorce was frowned upon in the 1800’s so Essie was trapped. To her relief, one day her husband disappeared without a word. Several months later Essie received an impassioned letter from her husband claiming he had moved west to get a fresh start. He went on to describe how he was a reformed man in everyway. 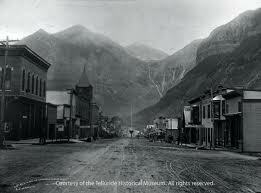 With encouragement from her family Essie traveled to Telluride, Colorado to reunite with her husband. What she found when she arrived was very disappointing. Far from being a reformed man her husband’s abuses had actually worsened. When Essie’s brother and his wife visited they were shocked by Essie's haggard appearance. Even more startling to them was Mentzer’s state of mind. During their visit Mentzer’s behavior steadily went down hill. He drank all the time and took more and more pills. In a daze, Mentzer shot Essie in the head in front of her bother killing her. Mentzer did not live much longer than Essie for her brother immediately beat him to death. His actions were considered justified so he was not prosecuted. 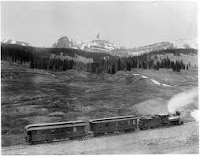 Within a few weeks of Essie’s death people boarding a train at Telluride station noticed an anxious young woman looking around in fear as she stood on the platform. Once everyone was on the train several passengers asked the young woman if something was wrong, she told them, “He’s coming for me!” As she became noticeably more distressed one of the passengers sent for the train conductor. When the conductor entered the car he recognized her as the local doctor’s wife. When he addressed her by name she screamed loudly and then to everyone’s horror and amazement she faded away. This same scenario was witnessed over and over again for many years. Essie’s ghost would always disappear when addressed by name or when the train got ten miles out of town. When the Rio Grande Southern stopped running out of Telluride people stopped seeing Essie’s ghost. The Brookdale Lodge near Boulder Creek was built in 1924. It has many unique features. 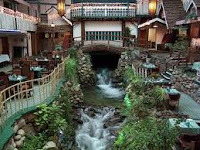 One that I have always found interesting is that a past owner of the lodge built a dinning room or “Brook Room” as it is called around a natural stream so guests and visitors sit and eat in a room with a stream rushing through it. Another feature I find fascinating is that the lodge has many secret tunnels and hidden rooms within its walls. These were built in the 1940s and 50s when gangsters frequented the lodge. Their activities resulted in rumors being circulated that there are bodies buried beneath the lodge. The Lodge was originally a lumber mill that was turned into a campground and lodge in the 1900s for tourists who visited the beautiful redwoods in the Santa Cruz Mountains in California. Like most popular resorts in California the lodge has hosted many famous visitors. Including, Marilyn Monroe, Tyrone Power, Joan Crawford, and Rita Hayworth. President Herbert Hoover also visited the lodge. The Brookdale has several resident ghosts that have been seen over the years. The most frequently seen ghost is that of a young girl by the name of Sarah Logan. She was the six year-old niece of a past owner. She tragically drowned in the dinning room’s creek. She is seen wearing a blue and white Sunday dress, walking through the lobby or playing near the fireplace that sits between the lobby and the Brook Room. One visitor who was a little girl at the time she and her family stayed at Brookdale, saw Sarah Logan. As she and her family ate in the Brook Room she spotted a young girl in an odd dress playing near the indoor stream, she pleaded with her parents to let her go play with this girl. They refused her request and she remembers she was perplexed that they did not see the girl she was pointing out. Sarah is known to approach guests crying for her mother. When they respond by turning to look for her mother she vanishes. Two recent owners were so disturbed by her presence—they saw her run silently across the lobby floor and then disappear through the office window—they called in clergy and a psyhic to get rid of her ghost. Their attempts failed, Sarah is still seen at the lodge today.